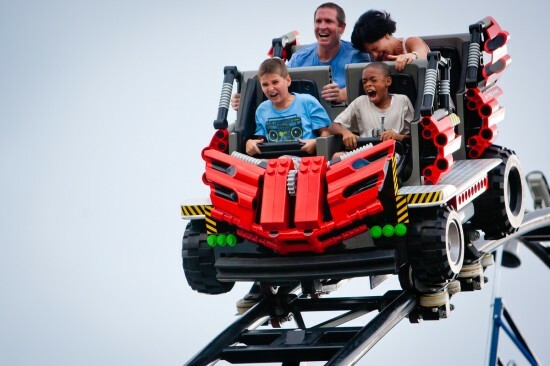 This summer, Legoland Florida is helping families deal with Veloxrotaphobia, or fear of roller coasters, by arming parents with “Roller Coaster Readiness” tips. Brochures featuring the tips will be available online and at the front gate and include things families can do before they leave home and during the day, as well as ways to manage a melt-down and ways to celebrate at the end of the day. According to Bartell, there are a host of mistakes parents commonly make when it comes to handling their child’s fear of roller coasters. Learn Online – Young children (especially those who are anxious), don’t like surprises. So, visit theme park websites with your child and look at the different attractions, discussing how much fun each one will be. Tell a Story – Talk to your child about fun roller-coaster experiences that you and other people had when they were kids. Be as animated, silly and positive as possible. Focus on Fun – As you arrive, review the park map and point out all the fun attractions, not just the roller coasters. Take it Slow – Invite your child to pick which attractions she most wants to experience. If she is reluctant to try the roller coasters, begin with at least a couple of her choices. Watch and Learn – When some people in your party are eager to try a roller coaster, don’t split up. Rather, watch the roller coaster ride with your reluctant child, all the time commenting excitedly about how much fun it looks and how happy and excited kids are as they come off the ride. Point out that kids coming off the ride do not look scared and are not crying. Nervous is Normal – Explain that while riding a roller coaster, it is normal to feel a little nervous, scream, close your eyes, and squeeze someone’s hand – in fact, it is part of the fun. Explain that feeling a bit nervous doesn’t mean you are too scared to go on the roller coaster. No Regrets – If your child expresses regret that he didn’t try the roller coaster, don’t make him feel bad. Now that the day is over, it’s easy for him to ‘be brave.’ Instead, remind him there is always a next time, and that he should focus on the rides he enjoyed and the fun that was had by all. Some good points in that for general use in respecting a child or anyone. Good for Legoland, this helps kids with Veloxrotaphobia[the fear of costers] and the theampark indistry.